Most often retailers do not allow merchandise to be returned for cash. They will gladly allow merchandise to be exchanged for other merchandise of the same value. When the customer does not find anything in stock that he or she wished to buy in exchange it is common to issue a return credit that can be used at a future date towards all or part of a purchase. While a printed return ticket can serve to assure the customer that he or she has this return credit. It is important for the retailer to have a control of which customers have return credit balances and the amount of return credit they have. This allows the retailer to avoid fraud related to return credits. By design this field cannot be directly edited. Only Sales and Return documents can affect the Return Credit Balance. This balance is totally separate from any layaway balance or credit balance. Once the Return is printed the amount of payment you entered as Return Credit will be added to the specified customer's Return Credit Balance. The next thing that would happen at some point is that this customer would return to purchase something and want to use some or all of his or her Return Credit Balance to pay for this new purchase. Just as on the Return, in Invoicing you can use the Return Credit payment type to pay for all or part of the amount of the new Invoice. Just as in Returns if you try printing an Invoice with some amount shown as Return Credit payment amount, XpertMart™ will give you a warning message if there is no customer specified and will not let you to proceed to print the invoice until you specify which customer the Return Credit refers to. XpertMart™ will not allow you to proceed to print this invoice until the Return Credit payment amount is less than or equal to the Return Credit Balance. You can combine cash or other payment types with the Return Credit payment type in order to complete the payment for the Invoice. When the Return Credit payment amount is less than or equal to the Return Credit Balance for the customer, then XpertMart™ allows you to proceed and print the Invoice. The amount of Return Credit payment type of the Invoice is subtracted from the Return Credit Balance for this customer. 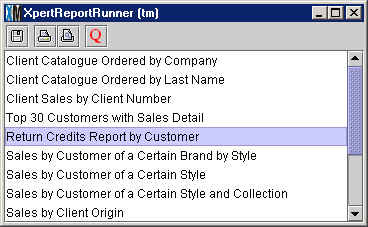 The Return Credit payments will show up on your POS payment type reports.